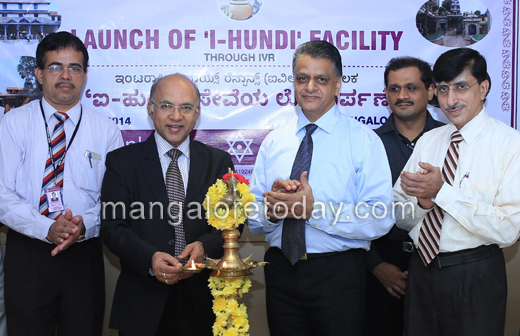 Mangalore, August 11, 2014: City based private sector bank - Karnataka Bank has launched yet another novel service ‘i-Hundi’ facility through Interactive Voice Response [IVR] channel. ‘i-Hundi’ is a unique service through which Bank’s customers can donate funds to adored deities/temples/trusts, which are registered with the Bank by calling the Bank from their registered mobile numbers through IVR channel. This service is one of the easiest, quickest and safest channels of donation. Launching the ‘i-Hundi’ facility P Jayarama Bhat, MD &CEO of the Bank said “Karnataka Bank is pioneer in introducing various customer friendly technology services and now has launched this unique online fund transfer interface to facilitate our valued customer to make hassle free ‘e-Kanike’. Bank had earlier introduced the ‘e-Hundi’ facility through MoneyClick internet banking service which has become quite popular among its users. Bank is also in the process of providing ‘m-Hundi’ facility through Mobile Banking service”. He appealed to all the devotees to make best use of these services. Bank’s customers can make a call from their registered mobile numbers with the Bank to the designated Toll Free IVR numbers i.e. 1800 425 1444 and 08022021500 for donating funds. It is a two step process i.e. customer has to make two Toll Free calls to IVR no.